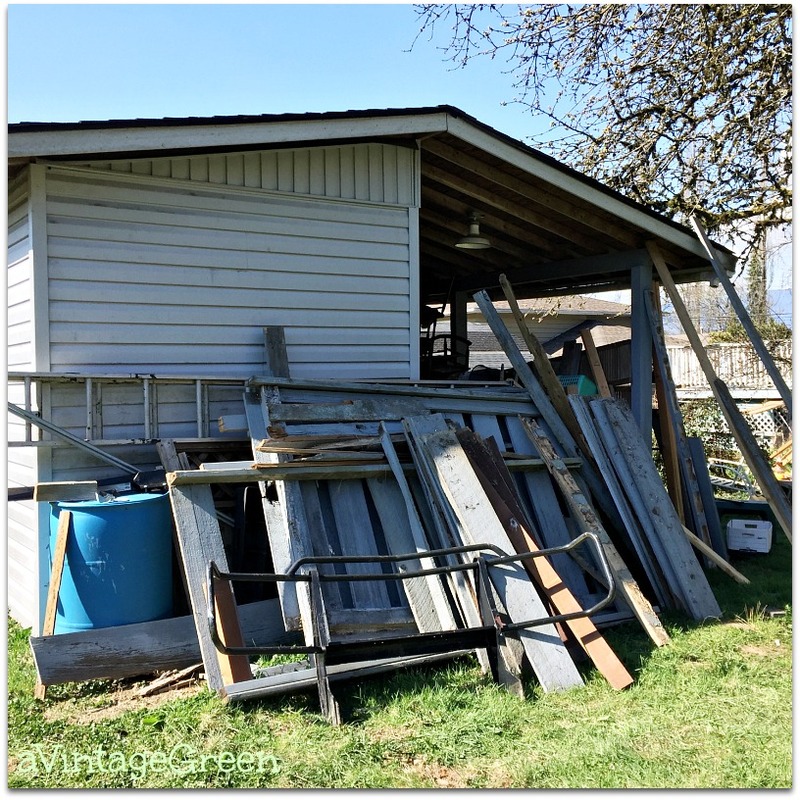 This past few weeks has been thinking about, planning, getting the necessary supplies - all for the big job of FENCE repairing. Early February our area had a huge wind storm which blew over many fences around town, winds this strong are not at all normal. 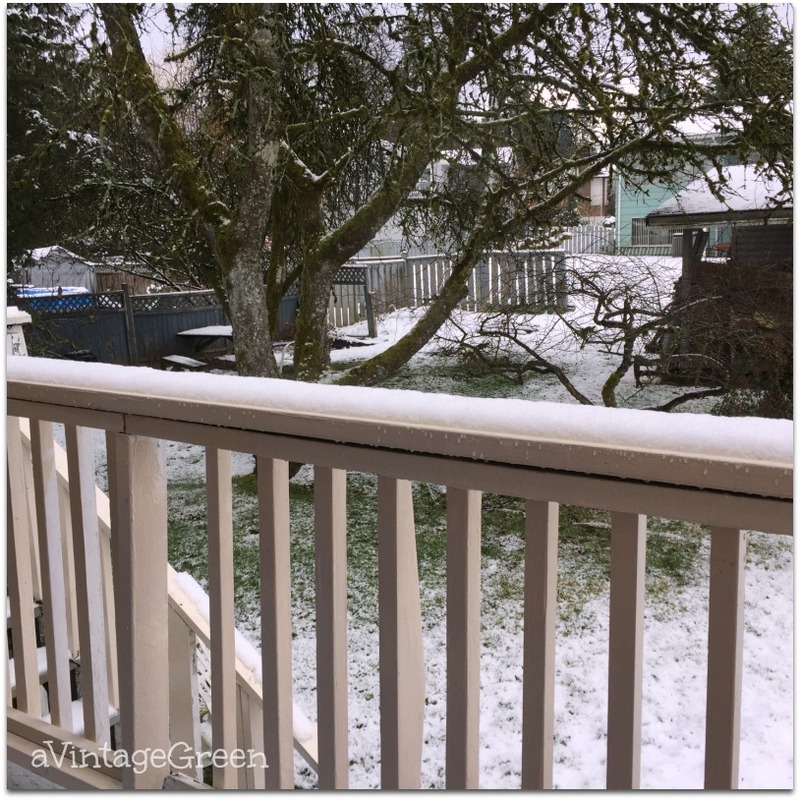 Since our grand-dogs have moved to new homes (one to pet heaven and one to the other grands) there was no rush to repair the damage, especially since snow, frozen ground, rain, snow etc. happened. Prep work included buying supplies we needed. 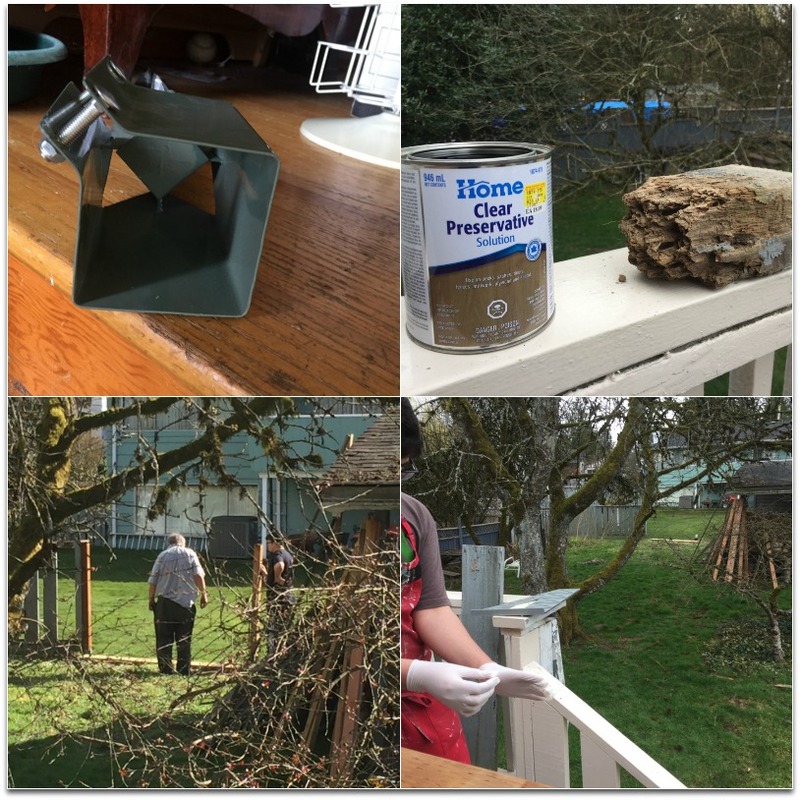 32 inch metal post holders for the 4x4 wooden posts, Preservative for the posts, 2 x 4's, 4x4 posts, various size screws, hangers for the 2x4's, grey stain for the boards. Our goal was to use anything that was already in our yard - recycling to the max. Re-used any posts and cedar fence boards that were in decent shape from fence repairs past and the pieces of cedar boards from the fallen fence. Checked our wood storage area and found two 2 x4's never used and two weathered 4x4's. DGS painted Clear Preservative on the post ends. Thank you. 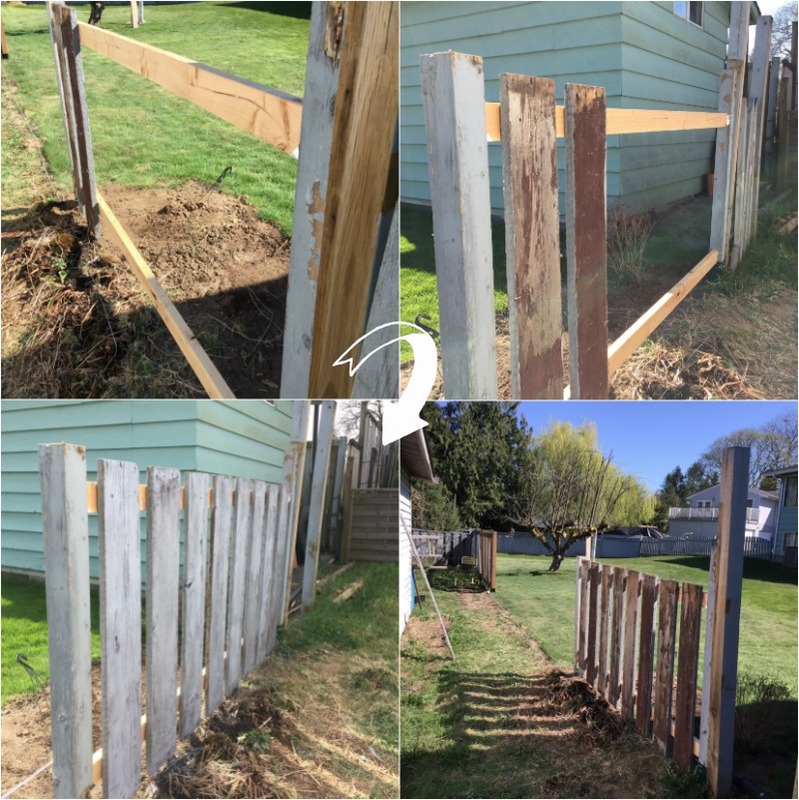 It's our fence, we will fix the fence ourselves, we have kept up the repairs for the last 39 years ourselves. Three weeks ago, with DGS's help DH cut off the 6 falling down fence sections and they moved each section to lean against the Shed. DGS removed the boards (and nails) from 2 sections. Then it snowed again, rained and repeated. Last week DGS worked with DH on placing posts and re-building the first section. One section built, painting to follow. 2nd section finished was the space from the 'gate' to the left. This section is not as tall as the original fence. Rotted board bottoms... and a handy chop saw made clean cuts and a somewhat shorter section. Lots of wasps flying around but so far we are being ignored. Sequence (after removing the pieces of the wind damaged fence) - pound down the post support, then add the post. Level. 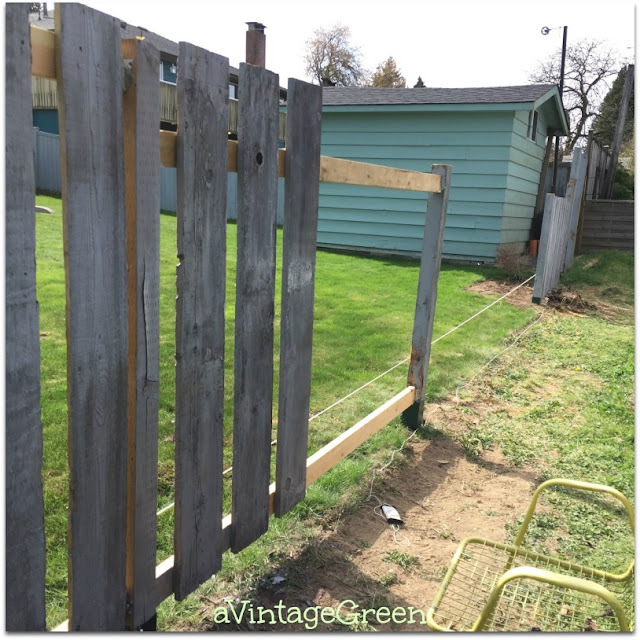 Attach hangers to the two 2x4's, add first hanger section to bottom to make sure space between posts in correct and then add the top hanger section to tighten up the posts. Fence boards were cut to the same length (bless the chop saw). Next step was painting the posts with.. (we put all the 'best' board sides toward the neighbours yard). DGS and DH built and I painted the finished 2nd section. This week DH, with me as helper, finished most of the 3rd section. Note that sections are not in linear sequence. Monday we put the 4x4 post in for the 3rd section of fencing plus finished adding the boards to section 1. Tuesday (this week) was not much fun at all. First we put in the right-end post support (this involved a sledge hammer), then the post was installed and tightened. The two 2x4's with hangers were levelled and screwed in place, bottom first, top second. Measured and trimmed several boards. Found 5 that were long enough, installed 3, took 2 up to the house deck, re-glued cracks and painted (they are undercover now because of RAIN). I painted all the brown installed boards with grey paint. (as well as the previous 2 sections). Several years ago we had a 'good neighbour' Mr. Brown. He and DH worked together on keeping our good neighbour fence in great shape. He always painted his boards brown. The brown boards we used for our repair these past weeks were from his side of the fence. Thicker, in better shape and OLD. He painted his house brown too. Bless Mr. Brown (yes that was his name), he passed a few years ago. 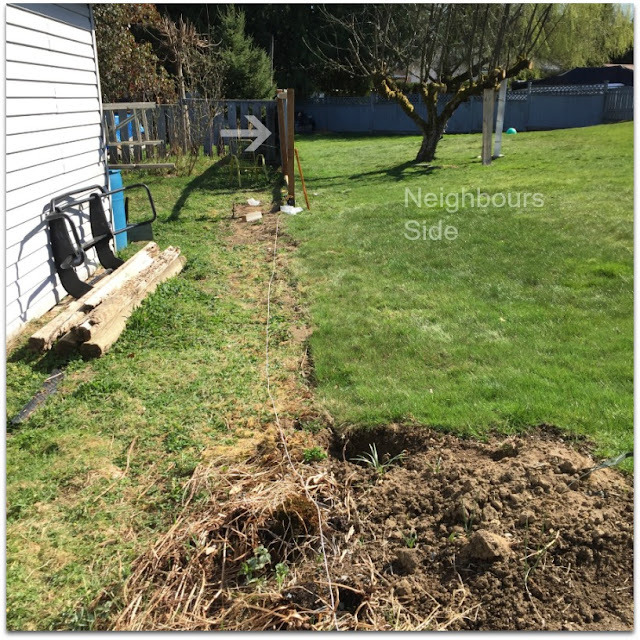 The good neighbour fence was removed by the buyer. 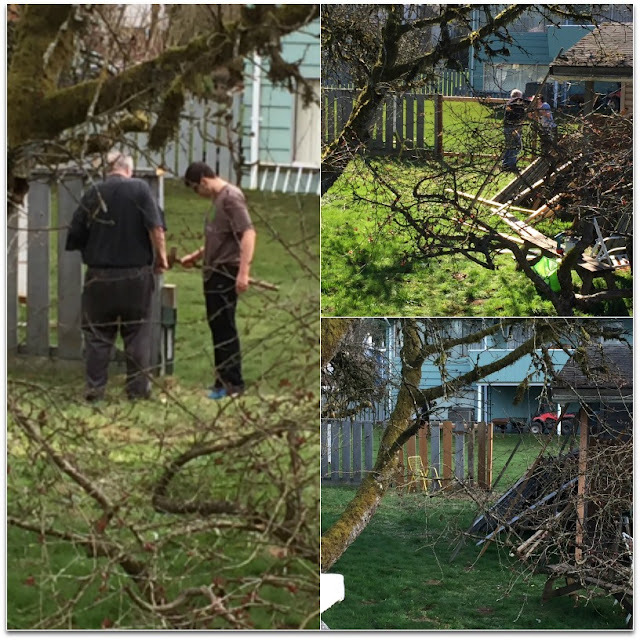 I had worked hard to save as many boards from Mr. Brown's fence as possible before they hauled them away and we are using many of those boards for our current repair work. The side facing the back yard neighbours has our original 'grey painted side and we have the brown board side with the freshly applied grey stain. We will add the next 2 boards tomorrow unless it is pouring rain. P.S. It poured rain Wednesday so we stayed in. Next job is moving the section of fence cut off 4 weeks ago so we can measure and find long enough boards for this and the next three sections. DH is also making a 'replacement' gate and we will hope we will finish the rest of the fence replacement during the next several days. My plan is to share the rest of the work and the finished job next week. Thanks for hanging in (fence hanging joke) today. Well done on building your fence - especially with recycled materials. It's difficult to get good neighbors (one reason why we aren't moving). A lot of fences here took a beating this winter, lots of wind storms. Ours is only 6 years old so it was fine, plus it is somewhat protected except the gates on either side. What a lot of work! And I suppose Neighbour didn't offer to help either. It will ook great when you're done, but you will be worn out, I'm sure. Wow! What an enormous job! We have fence that needs replacing but we'll wait for it to fall over first...its technically not broken yet! lol I like your "new" fence, it looks GREAT! Such a huge job but you are getting it done! Good for all of you and your husband and that wonderful grandson of yours. Have a wonderful day.